Have you heard about the new scheme of LIC (Life Insurance Corporation) of India? This plan has come up with more benefits and features. The plan is named as “LIC Jeevan Pragati Plan No. 838”. Let’s know more about it here. 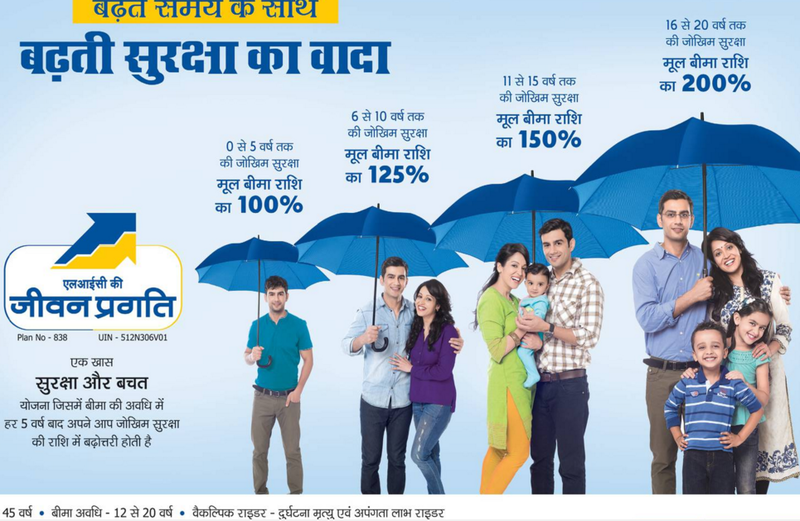 LIC Jeevan Pragati come up with new tag line "Badhte samay ke saath, badhti suraksha ka vada" as it gives increasing risk cover at every 5 year. LIC of India is a leading company that provides insurance services since many years. It launches new insurance plans every year with additional features and advantages in it. LIC has launched LIC Jeevan Pragati Plan today on 3rd February 2016 (you can buy from now). It is a non-linked with profit endowment assurance plan. Here are the eligibility conditions to apply. 1. The minimum age at entry for life assured is 12 years completed. 2. The maximum age at entry for life assured is 45 years nearer birthday. 3. The maximum age at maturity of life assured is 65 years. 4. The minimum policy term is 12 years and maximum policy term is 20 years. 5. The minimum basic sum assured is 150000 and there is no limit for maximum basic sum assured. 6. There are options available for mode of premium payment such as yearly, half yearly, quarterly, and monthly. If death of life assured occurs during the policy term, the death benefit equals to “Sum assured to death” with conferred simple reversionary bonus and FAB (Final Additional Bonus) if any, will be payable. The death benefit stated here will not be less than the 105% of absolute premium paid up to the death of life assured. 1. LIC’s accidental death and disability rider UIN (512B209V01) –If this benefit is selected for an additional amount equal to the accidental benefit sum assured is payable on death due to accident, provided the rider is in complete force at the time of the accident. 2. You can avail loan facility after full payment of 3 years of premium. 3. Policy can be submitted after payment of complete 3 years of premium. 4. Taxes will be applicable as per the rules. 5. You can date back the policy in same financial year. 6. Assignment and nomination can be made in the LIC Jeevan Pragati Plan. 7. You get free look period of 15 days available from date of receipt of the policy bond. Should We Buy LIC Jeevan Pragati? Since its Endowment plan and the only benefit i can see is that you get your policy cover (sum assured) increased with your age (mean Policy Term). Policy term is 20 years and every 5 year 50% sum assured will be increased. So, if we buy minimum policy of Rs.1,50,000/- every year we have to pay Rs.7612/- of premium for 20 years, and at the end of 20 years you will get bonus plus final additional bonus. Here we are assuming Rs.42 per thousand of Sum Assured (calculating from past LIC policy premium) and Rs.400 of Final Additional Bonus (FAB), so you get Rs.3,36,000 for Policy of Rs.1,50,000 after 21 year. Which is only 7% of Return? Yes, you get nearly 7% of return in LIC Jeevan Pragati. So, as per this return, we should better invest in ELSS Mutual Funds or even PPF (Public Provident Fund) account will give you more return. We have already listed tax saving options (in case if you are buying LIC just for tax saving purpose). Better to avoid LIC Jeevan Pragati. In the year 2016, LIC come up with many more LIC policy like LIC Jeevan Shikhar and LIC Jeevan Labh (which are also targeting last time tax savers).